For as long as coins have circulated, collectors have coveted them. In Renaissance Europe, coin collecting was the ‘hobby of kings’, because it was a favourite pastime of royalty and those with hefty disposable incomes. Nowadays, just about anyone with an interest in coins can start a collection, but it’s a good idea to stick to these coin collecting rules of thumb. Educate yourself about the story of how your coins came to exist. This alone can often have more value – both sentimental and monetary – than the object. The internet, as well as the Royal Australian Mint are wonderful resources for exploring the history of coins. Collecting coins can be a fulfilling, lifelong hobby that forges friendships. Seek out coin clubs and coin shows to share your hobby with like-minded enthusiasts. Haphazardly accumulating coins is vastly different from actually collecting – a much more refined and purposeful exercise that demands organisation. Purists insist that the best way to organise a collection is by date and mint mark, but really, the collection should reflect your personal tastes. Consider grouping coins by types, dates, mint marks, topical sets or uncirculated mint sets. Whether the coins are intended for resale or simply yours to admire, store them securely and cleanly. Various retailers sell coin collecting supplies at different prices, including display folders and cleaning gear. While some have managed to make big money from selling their grand collections, coin collecting is no get-rich-quick scheme by any stretch of the imagination! You will get the most out of coin collecting if you do it out of passion and a respect for the stories and artistry your coins represent. Numismatics is the study of currency, meaning that all coin collectors can call themselves numismatists. Australia’s first minted coin is the Holey Dollar, and it’s highly sought-after by coin collectors. There are circulated coins that are sent out into the population for daily use, and uncirculated coins that are rare and treasured collectors’ pieces. In 2013, a triangular $5 coin was made to commemorate the anniversary of Parliament House. Many of Australia’s out-of-use one- and two-cent coins were melted down and turned into medals for the Sydney Olympics, so that all of Australia was part of the event. 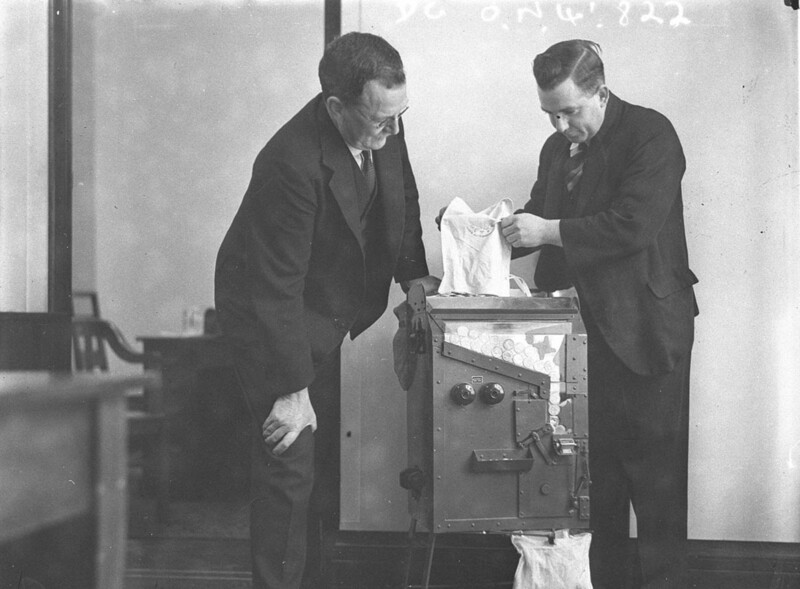 Image: Commonwealth Bank Officials testing a new coin counting and sorting machine c. 1930. Image courtesy of State Library of New South Wales/FL1290598.